Craig Cadwalader at Ardell sends news that he's now the central agent for sale of the 47.09m motor yacht Arethusa and she's also had another price cut - this time of €3 million. Built to a Michael Leach design by Nereids in 2008, she’s the third superyacht from this Turkish yard. With full MCA certification and measuring in at just under the 500grt ISM limit, she’s been a very successful charter yacht but at the same time offers her new owner a safe and well equipped private yacht. Arethusa sleeps 10 guests in a master, two doubles and two twins. 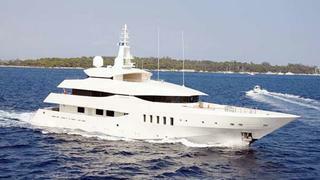 She’ll be anchored off Monaco during the show ready for inspection, now asking €12 million.